JRD (Junior Racing Developments) have issued the following press release after last weeks Junior Top Guns events held at OGKRC. Subject: Damon Strongman takes out prize of JRD test drive at the 2011 Junior Top Guns. Damon Strongman has taken out the 2011 Junior Racing Development prize of a test day in one of the teams Sabre 02 Formula Vees. Following a late switch of the sponsored category after consultation between the Oakleigh kart club and JRD due to insufficient entries in the Junior Clubman class, Junior National Light drivers were given the opportunity to win the test drive and Damon made the most of it. Although closely challenged all weekend by Liam McLellan, Justin Francis and Justin Black, Damon was ultimately too strong and took pole position on both nights and all race wins. An enthusiastic Damon commented after his win, “I really want to thank dad and all of my sponsors – Karcher Australia, Adam Macrow Racing and Ash Budd Photography. I also want to thank Junior Racing Development for this wonderful prize and opportunity; I can’t wait to test the Sabre 02”. “The guys in JNL really put on a good show this weekend and Damon was a standout with his 4 race wins. Damon showed a great deal of maturity in his driving and wasn’t just fast, but stayed calm when under pressure and showed he could be really consistent which is what we look for in our drivers. The two Justin’s and Liam also did a great job and also showed good form amongst a nearly full grid” agreed JRD’s Daniel Reinhardt, Brett MacLennan and Michael Reinhardt. “It was unfortunate that the small number of entries for Junior Clubman necessitated a change in categories, however the JNL class were fantastic and we are pleased with the way the drivers performed. We will be exploring other categories with the club before next years event and will look to have an announcement out early as to which category we will be supporting” said Brett MacLennan. As Damon is still a little too young to take his prize due to licence restrictions, JRD will be taking an active interest in his results over the course of the year and will conduct the test as soon as Damon is able. Held in stifling conditions, the first Rotax Pro Tour round of 2011 has been completed. Results and commentary are available via the official Rotax Pro Tour Twitter feed. The club committee has decided to start the club day racing year with a day / night race meeting. These events are always popular, so when entries open, please help the race secretary by entering online, and early. The race entry fee is $45 per competitor for the first class entered, and $25 for the second or additional classes. Don’t forget to bring your clear visor as these are required when the track lights are illuminated. Racing is to be held on Saturday February 26, so start practicing now. Please ensure that your racing license and club membership are valid and up to date. Feature classes on the day will be Clubman O35 and Junior National Heavy. Prize money for the feature classes will be: 1st place $75, 2nd $50, 3rd $25. The following classes / weights will be offered in February and trophies will be awarded for the first three place getters. The Oakleigh Go Kart Racing Club website is currently undergoing maintenance. Please visit again soon. Some club members have been asking whether there will be a club day in January. The answer is no. Practice for Junior Top Guns competitors will be held Thursday night, January 20. Hopefully for everyone concerned the weather conditions will be much dryer this week. Round one of Junior Top Guns will be held on Friday January 21. Round two will be held on Saturday January 22. As both rounds are separate race meetings, you are required to complete separate entries for each round. The timetable will be as per the original supp regs. Practice will begin at 12pm followed by qualifying at 5pm. Each round will present trophies down to 5th place for each class. A $725 prize pool per class for total points over the 2 rounds is also up for grabs. To be eligible for the series and cash prizes, competitors will need to compete in both rounds. Only those competitors who enter both rounds of Junior Top Guns and are present at the prize draw will be eligible to win the Arrow rolling chassis. This year the Junior Clubman driver who accumulates the greatest number of combined points across both rounds of the series will be rewarded with a full test day in a Sabre 02 Formula Vee at Winton Motor Raceway. Currently only 6 entries have been received for Junior Clubman, so get your entries in now for a chance to win this great prize. The 2011 Karting calendar kicks off with the annual Junior Top Guns race meetings on Friday January 21 and 22. Junior Tops Guns are two of the country’s premier “not to be missed” events. These race events which are run during the school holidays, are a great opportunity for karters around Australia to come and enjoy racing under lights prior to the commencement of the school year. A Brand New Arrow Chassis will be given away to one series competitor. Big thanks to DPE and DP Karts for sponsoring this prize. The Oakleigh Go Kart Racing Club wishes to thank Concept Karting & Racegear for their generous sponsorship of the 2011 Junior Top Guns Events. Concept Karting & Racegear has provided the club with MD Mini Video Cameras and Lico (by Sparco) Travel Bags to be given away to lucky competitors. Junior Racing Developments is pleased to announce their sponsorship of the 2011 Junior Top Guns events. This year the Junior Clubman driver who accumulates the greatest number of combined points across both rounds of the championship will be rewarded with a full day test in one of the teams Championship winning Sabre 02 Formula Vee’s at Winton Motor Raceway. 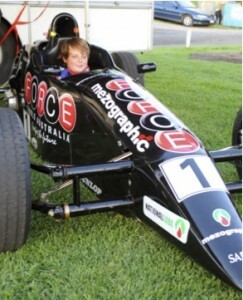 Oakleigh Go Kart Racing Club also wishes to thank CC Racing, J&A Tuning, Page Bros RV, F1 Management, MKC, Spectrum & Synergy Motorsport for their sponsorship of the 2011 Junior Top Guns Events. Supp regs for both rounds are available on the VKA website. Online Entries. Log on to your driver information via the AKA Licensing system using your ID number and password. Under the My Details function, choose Pre Enter Race Meeting. Offline Entries. Please post to PO Box 215, Braeside, VIC 3195 or fax to (03) 9758 4511. 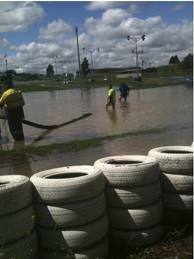 The flood waters which caused the postponement of Junior Top Guns Round 1 have been cleared. Any interstate drivers who have stayed in Melbourne for next weekends rescheduled event, can contact the club if they need track access for practise during the week. Fellow Go Karters, On behalf of President Adam Bourke and the committee of the Oakleigh Go Kart Racing Club, I would like to thank everyone for the positive response we received when we had to make the difficult call of postponing Top Guns for this Friday night, 14th January 2011. 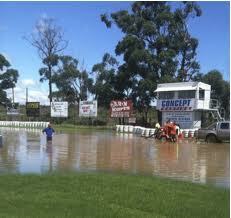 Even though the sun is now shining, we did have some major flooding along the back straight and canteen corner. This flooding is the result of levy banks breaking in one of the neighbouring properties, releasing a deluge of water onto the track. Due to this excess water, we have postponed the meeting to Friday 21st and Saturday 22nd January, following the same timetable schedule. Adam and I would like to thank the committee members that spent the day at the track pumping thousands of litres of water off the track. If you have any queries or are unable to attend round 1 or round 2 of Top Guns then please email racesecretary@ogkrc.com.au. If you have not entered either dates and would like to enter, we will be taking entries up until Thursday 20th January. 12.00pm Newsflash – Due to torrential overnight rains, Junior Top Guns Round 1 has had to be rescheduled for Friday 21st January. Junior Top Guns Round 2 will run the day after on Saturday 22nd January.